As we make our way across the empty beach, the sun is giving last light to the bubbling clouds. We climb, a group of twenty or so excited nature-lovers, onto the cliff top. Around us, a babbling is beginning in the grasslands. The birds are coming in to nest. And we crouch on the sandy path as the shearwater birds flap and flutter and dive overhead, shooting in from their long day at sea to their cosy burrows. The whole show lasts about fifteen minutes. Showering the darkening sky with their busy wings. The Shearwater Festival is bringing attention to these fascinating seabirds. Now in its third year, it garners the community on tiny Philip Island, near Melbourne, to a show of love and care towards their returning travellers. In winter, the shearwater leave their Island nests and fly North to Alaska, where they find the food they need to survive another year. Now, in mid-November, almost to a predictable day, the shearwater return. For the Aboriginal locals, this was a feeding season for them, too. Aunty Doris Paton tells me that her people would camp here for months, feasting on “mutton birds”, as they are known and then, like the birds, moving to another landscape when the season demanded it. Scratching our heads with wonder, we watch as Graeme shows us the flight path of the birds. He tracks them using modern computer technology and we see the cycles of a single male bird. Arriving back on Australian shores in November, the bird finds a mate and they lay a single egg. The parents then take it in turns to fly South, to Antarctica, to fill their bird bellies with protein-rich krill. After she has laid, the male takes first turn in the nest, allowing Mum to re-fuel after her delivery. Then they swap, each spending days in the krill fields, putting on weight and bringing home food for their chick. When March comes around, the parents take a last visit to Antarctica, before embarking on a 12,000km trip north. We can see their route. Up to Japan, then all the way to the Bering Strait, where they make their second home. The Shearwater Festival is organised by the Deep Listening Project. Championing a way of being which is rich in Aboriginal tradition, Deep Listening is the underlying concept of the art, song, dance and music in which we are all invited to participate. Known in some Aboriginal languages as “Dadirri”, this way of knowing relies on listening not only with our ears, but with our eyes; with our hearts; and most importantly, with respect. Aunty Doris tells me that in contrast to our Western needs to “fill the gaps”, Aboriginal people are content to sit in silence. “In our way… we’re very comfortable with silence”, she says. “We can sit, and listen, and not talk”. One of the highlights for me, alongside music from Kutcha Edwards; Yirrmal and the Yolngu Boys and Archie Roach, we have music from the Deep Listening Band. 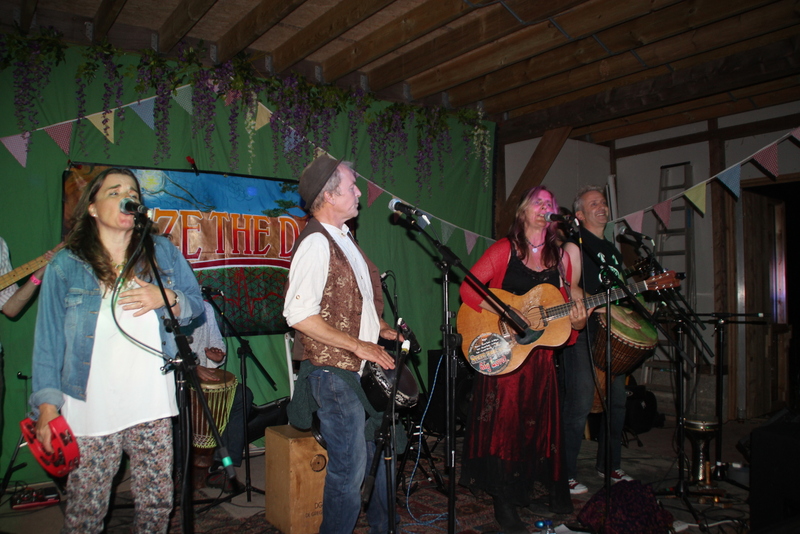 Ron Murray, a Wamba Wamba man, plays didge with the band. He tells me how he uses Deep Listening to “tune in” to his fellow musicians Michael Jordan and Steve Sedergreen. Each performance is improvised, each different, as the piano and the drums dance around the resonances of the didge, around the stories told by Ron. “It’s meditative”, he says. Back up on the cliff, it’s 5am in the morning and the shearwater birds line up on the path, using it like a runway to get up speed for a take-off. Their bodies, so graceful in the air, so efficient in the water, waddle awkwardly like slender ducks, until their narrow wings catch the breeze and lift them up to the pre-dawn sky. The bobbling from the surrounding tussocks is frenzied now. The “whoop, whoop, whoop” of their wings as they approach airborne brings to mind the first aeroplanes. Surely we must have watched these birds for inspiration? As the morning breaks overhead, the last shearwaters lift into the pale blue sky, leaving only a few nesting females behind. The landscape quietens, a swamp wallaby raises his gentle face in the distance and the small group of awestruck humans head off for a hearty breakfast. 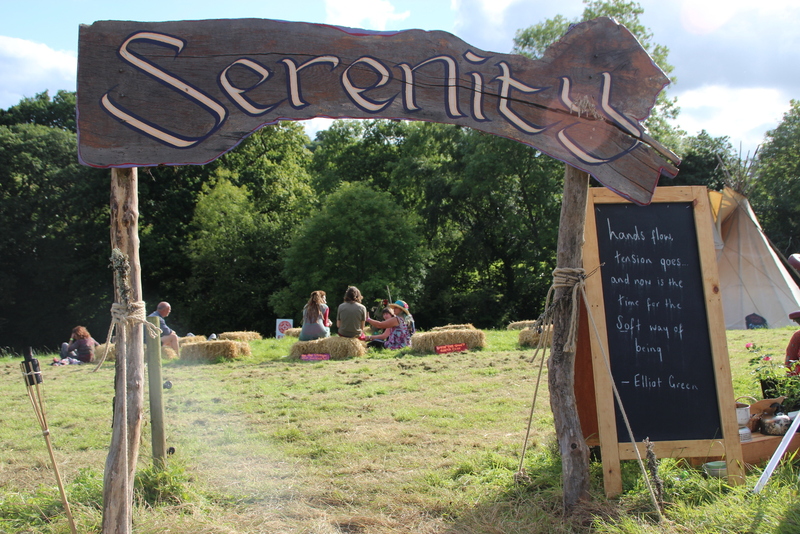 “I’ve never been to a festival like this before”, says Sarah-Jane, her blue eyes twinkling. “Where you start from an assumption that everyone is your friend”. And it’s true. What is extraordinary about the Commonground Festival in Seymour, near Melbourne, is not the beautiful red gum landscape; not the soul-scoring music; not the delicious home-grown, home-cooked food; not the inevitable problems with blocked toilets… All these are already festival favourites. What is extraordinary here is the intense feeling of connection; the strong sense of purpose; the deep, meaningful conversation; the sparkly, convivial atmosphere. It’s like a huge family party, without the starched formalities which often accompany such events. The festival is opened by indigenous elder Uncle Larry Walsh, who welcomes us to country in the lyrical language of the Taungurung people. “Wominjeka. Pallian beek.” He explains that the words are a welcome from his tribe, which stretches from East to West across this part of the Kulin nation. In my volunteer role documenting the weekend, I film him, my camera on a borrowed tripod, since I managed, somehow, to leave my tripod on the tram on the way here. Uncle Larry, his grey hair flowing free like the many rivers in his part of the world, congratulates Commonground on their thirtieth birthday. Thirty years since a small group of radical, like-minded health professionals pooled their resources to buy this block of land. Thirty years since they camped out, small children and all, and began to cook up a dream. They wanted to both create an intentional community and to support social change makers in their work for a more just and sustainable world. They hand built a rambling rabbit-warren of a building to house not only themselves, but groups who wanted a space to come together in. Fashioned from mud brick and recycled materials, it sits comfortably in the hillside overlooking hills and bushland. A tour takes us around the property, taking in the abundant veggie gardens, the apple orchard and the quirky octagonal structure which was their first attempt at construction. It’s ironic that this Festival takes place the same weekend as our appointed world leaders take the stage for the G20 summit in Brisbane. Despite Tony Abbott’s encouragement for them all to be in first name terms, there are few genuine friendships there. How different might the world look if power was in the hands of those who really cared? If all our governments were working for a more just and sustainable world? Instead, Abbott is calling for focus to be kept on economic growth – a concept which has long since proved itself to be out of step with the needs of both people and planet. Uncle Larry shares the stage with Kate Lewer, one of that small group of founders. Kate glows as he reminisces with her about the collaborations between Commonground and the Aboriginal community to decide how they could best work together to manage the land. It’s clear that he holds a fondness for these people and he stays around all night and all the next day – enjoying a yarn around the smoky fire as the music from the bands sings out across the tall gums. Whilst it’s true that this is a mostly white-face festival, there’s a general feeling that we are all on the same page when it comes to how to get along. And if we want some help with that, the workshops run by Commonground’s sister organisation, the Groupwork Institute on “Emotional Resilience” and “Working Collaboratively”, give us ideas and skills to take away. Lying in my tent and listening to the rain on Sunday morning, I switch on my phone and pick up some news about how the G20 is going. Tony Abbott has embarrassed himself once more by boasting about his regressive policies on carbon emissions, on asylum seekers and on health care. Vladimir Putin, although not shirt fronted, leaves the gathering early. Here at Commonground, though, we are reluctant to leave. We want to live always in this warm bubble of possibility. Weekends like this show us a way to be which is inclusive, considerate and conscious. As if to prove the theory, when I call Yarra trams to see if my tripod has been handed in, the man in the phone is delighted to tell me that they have it there waiting for me. Perhaps the bubble of possibility is, after all, for more than just a weekend. By European standards, the Rainbow Serpent Festival is small. By Australian standards, it’s huge – 18,000 people. 3 main music stages, and a central stalls area filled with the usual cheap cotton, studded leather and this year’s essential for the laydees – twerking pants. Happy Rainbow! is the refrain and it is, in spite of 36 degree sunshine and dust which makes it difficult to breathe and dyes the inside of your nose black. I’ve spent the morning at the solar cinema, run by Pippa and Rich from Future Art Research who have the shadiest spot on site. They showed my Lammas documentary on Friday and have entertained me since with Indigenous stories from Uncle Larry, sourdough breadmaking workshops using their solar oven and now, an interesting history of the activist scene in Australia. In the early noughties, Undercurrents Beyond Tv Festival was showing films from Jabiluka uranium mine protests and Woomera detention centre. That footage of the fence coming down and refugees spilling out into the desert is unforgettable. Now, the scene has shifted to the brilliant Lock the Gate campaign against coal seam gas and instead of just the usual suspects, farmers have united with locals to create a united resistence. We’re led into the discussion by a query about the lack of environmental awareness at this festival. My friend Cara has been flown in from the UK to do a talk on Free Economy and to show a film called Connected. She estimates her audience at 0.025 of the people here. She is camped in the artists quarter and is amazed by the DJs detailing their litany of flights to travel around the world for gigs. “What’s it all for” she laments. “Just to have a good time?”. David Holmgren‘s talk, however, is well attended, but then he’s a local. Known as the father of permaculture, he has established a self-sufficient homestead down the road in Hepburn Springs. He and his colleagues set up festivals in Tasmania, back in the day, which they wanted to be living examples of sustainability. They would plant veggies on site 6 months beforehand, so that festival-goers could harvest free food during their stay. 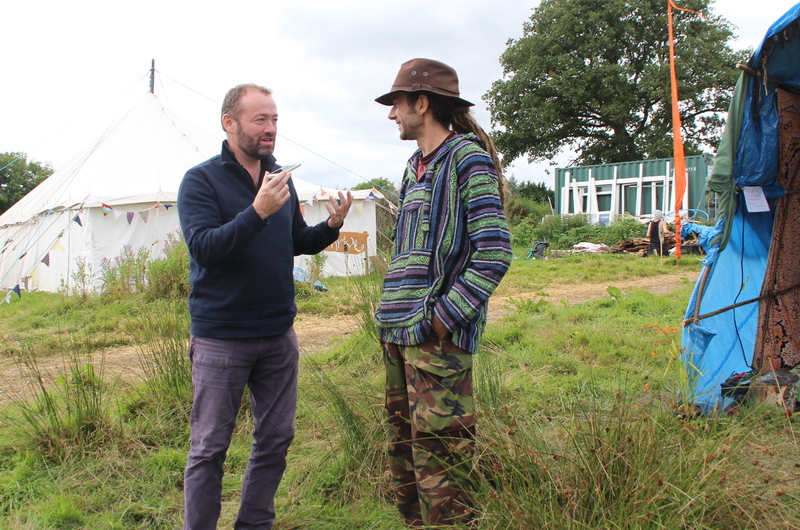 Here at Rainbow, they could take a few lessons from the Green Gathering, who run all of their site on renewable energy. If it’s possible in the UK, with all its rain and mud, it must be possible here, with its 36 degrees of sunshine.